Visuals are important for children with anxiety disorders and autism spectrum disorders. In order to help students remain calm during transitions throughout the day, many children use visual schedules. 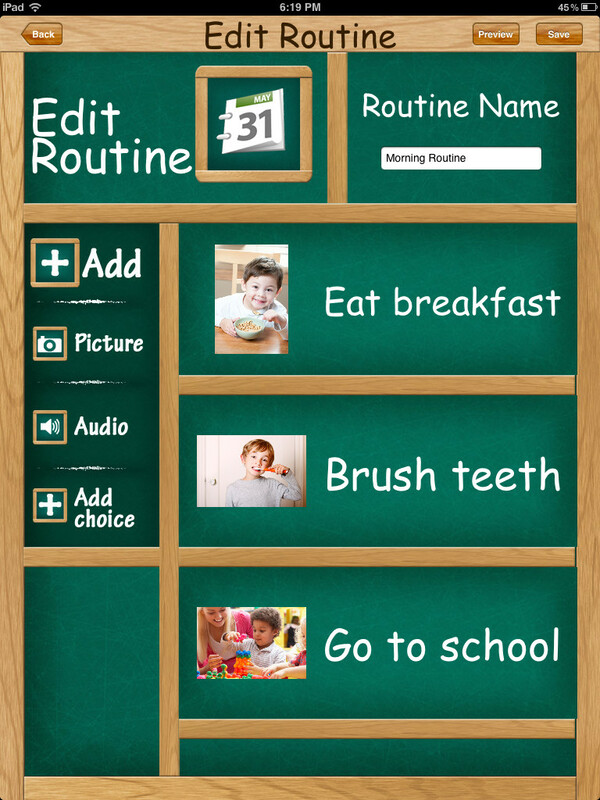 Visual Routine by Pufferfish Software is an easy-to-use, visual schedule creator/viewer that can be used with children with special needs. Continue reading for more information about this application and a giveaway! The Main Page of this application will show the following options: My Routines (previously created routines), New Routine, Edit Routines, and Options. This option will allow you to create a new routine. First, type the routine name by pressing the white box underneath to type a name on the keyboard. Then, press the "Add" button. Add text and then press "Save". To add an image to the task, press on the text or "Picture" button. You can "Take New", "Choose From Library", or "Choose From Stock". To add audio to a task, press the "Audio" button and then the "Start Record" button to begin recording. You can play back the recording by pressing "Play Record". Then, press the "Save" button. You can add choices to a task by pressing the "Add Choice" button. The choices will appear next to the task. Press the "Save" button to save the routine to the main page. To edit a routine, press "Edit My Routines". Then, choose a routine to edit from the list. There are two options for settings on the "Options" menu. You can choose for completed items to be shown or not and whether or not sound FX are to be played. The check mark means that the options are on. 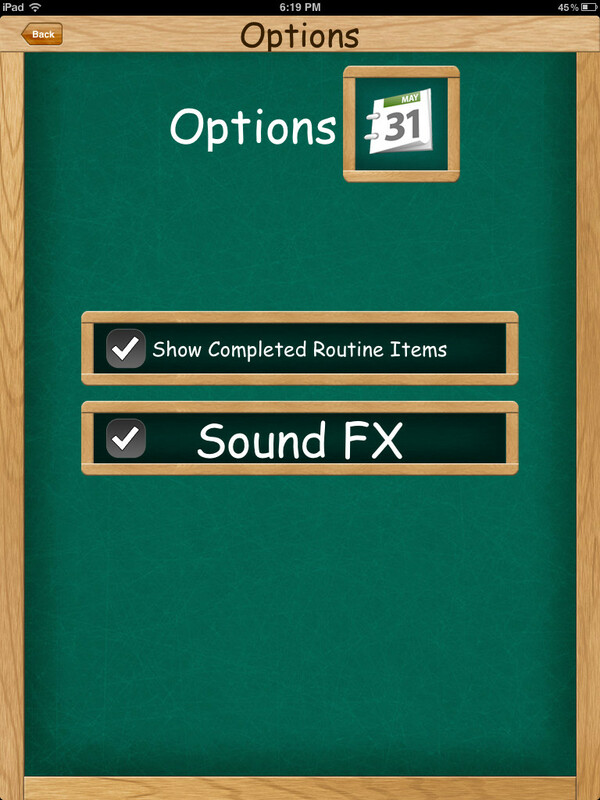 To play through a routine and view it (not in edit mode), choose the routine from the "My Routines" page. Then, it will show on the screen with check boxes next to the tasks. Once a task is complete, press the check mark and it will play a sound (if Sound FX are chosen to be on). The application provides a visual schedule for people with anxiety, TBI, or autism. Add pictures and sound to the schedule to help students who have difficulty reading. You can turn on or off sound effects if they are too distracting for the classroom setting or the student. There is the ability to save multiple routines to the application. The choices are difficult to view side by side of the tasks. Maybe if the choices were presented upon choosing a task on a different screen it would be less cluttered. I am not sure how to fix this. I would love for there to be more pre-installed images. Visual Schedule - Use this application as a visual schedule to help reduce the anxiety between transitions throughout the day. Sequencing - You can use this application to help children sequence events in their day or sequence steps to complete a task. 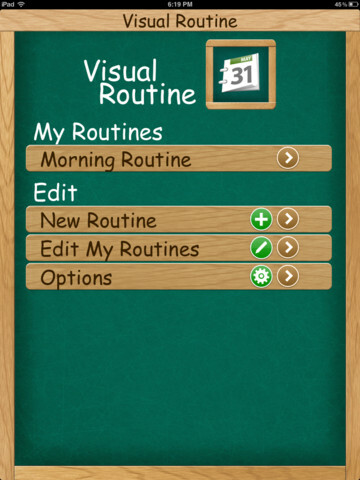 Visual Routine is available for the iPod Touch, iPhone, and iPad for $4.99. 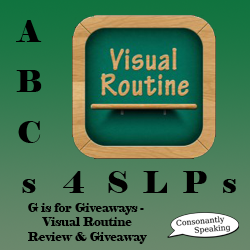 Consonantly Speaking was given a copy of Visual Routine to give away with this review. No other form of compensation was given. Enter in the giveaway below for your chance to win a copy of Visual Routine!